New Feature: Do you want to manage your analysis with different backlink campaigns? This month we are pleased to announce the launch of Campaigns to help you analyse your link data and competitors in a more visually appealing, efficient and understandable methodology. So imagine a campaign full of your competitors where you can physically see how their Trust Flow, backlinks, and other metrics are moving over time. Can you out-pace them? If their Trust Flow goes up, can you work our why and what they just did? This development will show you how you can turn our metrics that you’re analysing into a story. It’s a way to group and track a collection of domains or URLs over time. Every time the Fresh Index updates, so will your campaign. 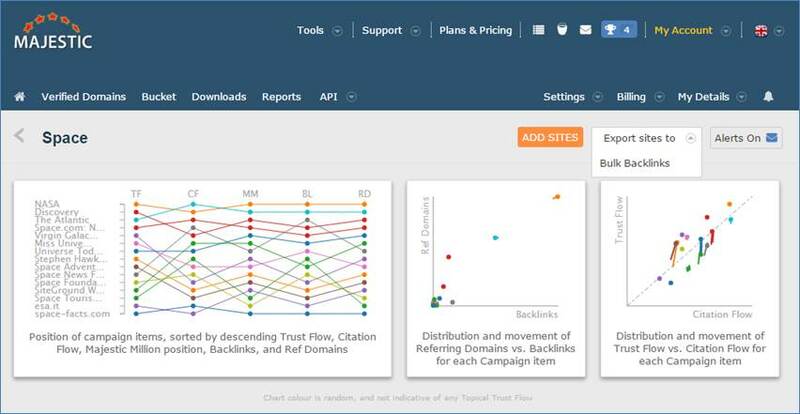 Summary graphs in each campaign will draw your eye to any domains or URL that have referring domain, backlink, Trust Flow or Citation Flow movement. Where can I find the campaigns and how do I set them up? 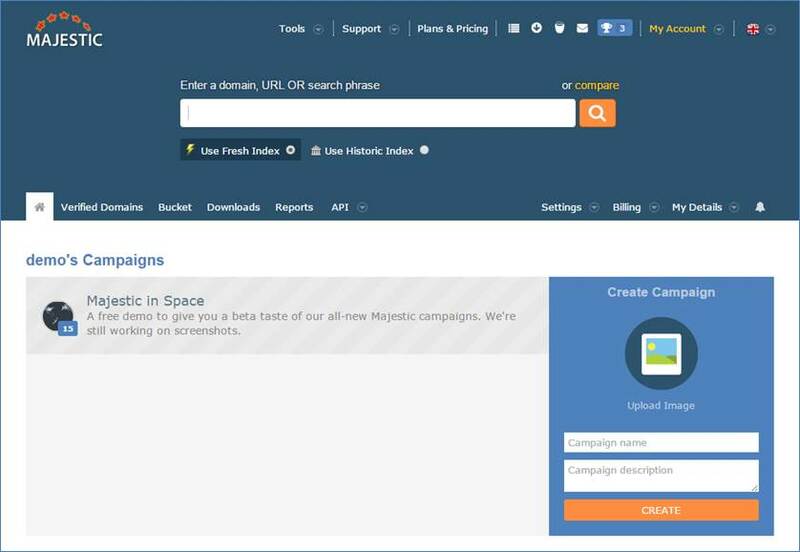 You can find the campaigns within your account page and to help you get to grips with the new Majestic feature we’ve set up a default campaign for you; (screenshot below) so you can view the benefits of analysing your link data via campaigns and see how each campaign you set up will be displayed. 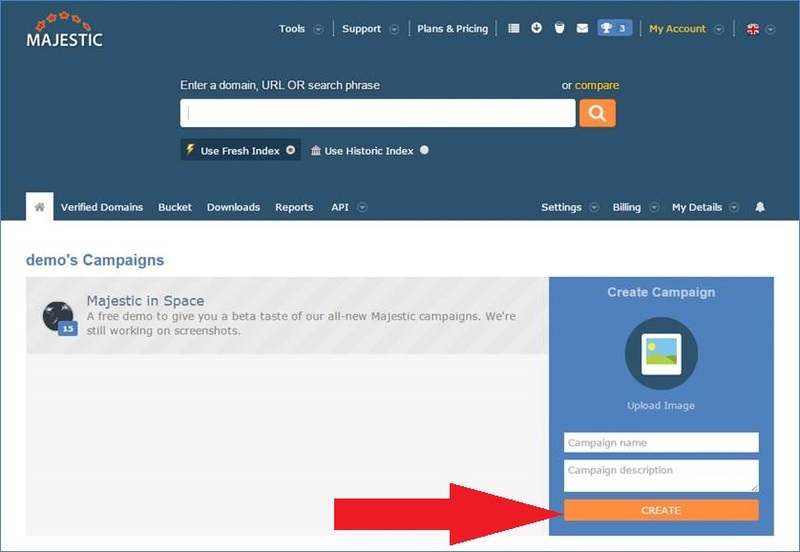 You can set up a new campaign on the right-hand side of the web page by filling in the name and description of a new campaign. Once set up, there are then three charts at the top of the page, within your campaign, which you can click on for more information inside each vertical, as well as a chart further down the page with the information listed in more detail. Should I track domains or URLs? While you can mix domains and URLs in your campaign, comparing items in your campaigns will work best when you track like-with-like (all root domains or all URLs). If you type or paste URLs into the input area, we will give you the option to automatically convert them into root domains. How many campaigns and sites can I set up? Campaign items are linked to our Tracking Reports. Adding a site to a campaign will create a tracking report and use up one report from your Report Unit allowance. You can find your remaining monthly limit in the Detailed Reports section of My Subscriptions. If you have any existing Tracking Reports or Verified Domains, these can be imported to a campaign for with no charge to your report units. Report Units recharge at the beginning of every month of your subscription. Can I import sites that I have saved in Majestic? Yes. You can paste from your existing Tracking Reports, Bucket items, or Verified Domains. We’re working on a way to add Advanced and Standard Report domains. Your data will update every time the Fresh Index does. When you set up a new campaign you will see initial values, but it will take a Fresh Index update before you start to see tracked data. Can I set up email alerts? Yes. You can set up regular Majestic email alerts from each campaign. These are done at each campaign level. You may want a Fresh Index update report for one campaign, but a weekly report for another. You can do that. 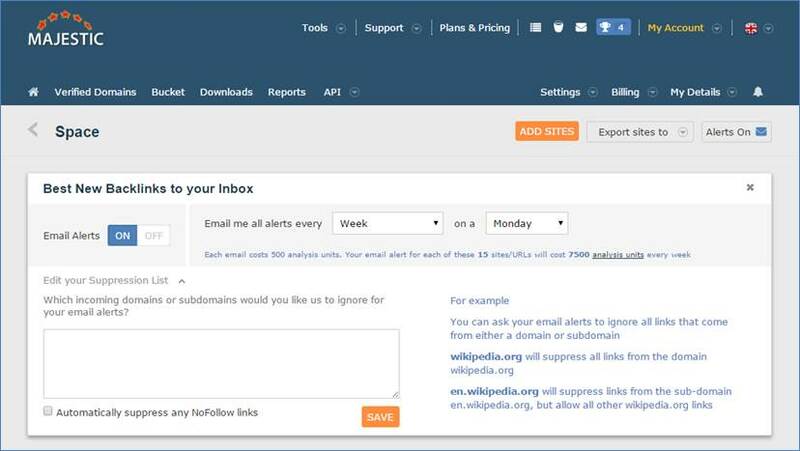 You will receive a separate email for each item in your campaign, and each email will cost 500 Analysable Backlinks units. You can set different email suppression lists for each campaign. But also note that any suppression lists which you have set up prior to the release are also worth checking as you may now want to suppress domains or subdomains according to a particular campaign. Can I export the data from my campaigns? Of course, when you’re within your campaign, you can export the data via the top right-hand corner. Just two more things; The Majestic Million value that we show in your report is always for the domain, not the URL. You will notice this, for example, if you’re comparing Twitter URLs. Then finally, at the time of launch the campaigns will be displayed in the English language but over the next few weeks you will be able to set up your campaigns in other languages too. Not totally sure that comment was genuine. But what the heck. This week I am counting comments as a measure of engagement 🙂 So. Thanks. This news was published in the official community by Google for webmasters. How many Campaigns can I create in the Silver subscription? Thank Davide. I programmed it all personally… OK – I lied. Great teamwork on this one. We hope to make some enhancements as well over the net few iterations. I have a suggestion to developers. The user should be able to add to Campaign a custom widget. For example, I am interested in the dynamic of follow/nofollow links ratio from "Backlink Breakdown". I would like to see the position and the data (interest) on the date of index update. Super! 🙂 More to come this week on this. We use a similar tool at Teksyte Ltd. Let try this new feature! Thanks for the Heads up on this great addition to your tools. Just keep them coming guys ! Will do! I think we have a good roll out plan over the next few months. Fantastic! Thank you for constantly improving the product. The Majestic crawler doesn’t seem to learn, and doesn’t accept my 404to301 WP plugin, which directs non-existing URLs (404) to an existing page. There was a non-functional website, which had just two pages "www.3dsoftware.nl/english’ and ‘www.3dsoftware.nl/dutch’ and a robots.txt file. Now the site has over 40 pages. Majestic12 is still looking for the old pages and the text file, and doesn’t find them. My WP plugin reports a 404, continuously. It is utterly annoying. We see pages to your domain. So the links exist and I guess that is why Majestic shows you your own inbound links for free, so you can see exactly this. I hope it is helpful, but please feel free to block our but if you would rather not know the other links to your site. You can see how at www.mj12bot.com. You can block us with one line of code, but the links of course will still exist. Sorry if I’m being thick, but can I use the Campaign feature to track URL paths? It looks like we can only add root domains or specific URLs at the minute. Yes you can. Simply make sure you put in the full URL, ideally including https:// or http:// as these versions can give very different crawl data (as Majestic.com does on its own site).